New Deli, Dec 01, 2017 : The government will bring a bill in the winter session of Parliament that will criminalise instant triple talaq, or talaq-e-biddat, and accord rights of maintenance and a child’s custody to the victim of such a divorce, according to a top source in the law ministry. A man attempting to divorce his wife through instant triple talaq in any form — spoken, written or communicated through electronic means like instant messages and emails — can be handed out three years’ imprisonment and a fine, the proposed law states. The offence will be cognisable and non-bailable. Talaq-e-biddat is a custom under Muslim personal law that allows a man to divorce his wife by uttering the word “talaq” thrice. Though a five-judge bench of the Supreme Court struck down the practice as illegal in a 3:2 judgement on August 22, it has continued, the source who has been involved in drafting the bill, said. In a recent case of ‘talaq-e-biddat’, a man working with a leading educational institution divorced his wife through . 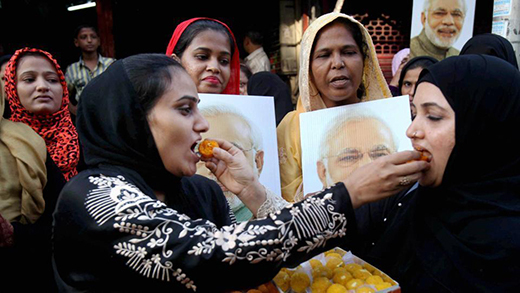 Women are rejoicing over Government law on Triple Talaq.